So 2014 is done with. It's over. Gone. Goodbye, adieu and all that. (Can you tell I'm not one for sentimentality???). But, as I was saying, 2015 is coming, and I guess we should fill these last days of 2014 with a bit of pondering and wondering over what has been. 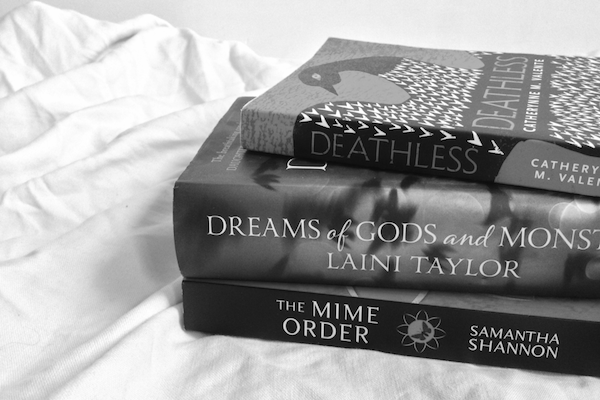 FANTASY: Earlier this year I discovered the Mistborn trilogy, which, inevitably, I fell in love with. I remember writing in my review something along the lines of – "if you read one fantasy trilogy this year, it needs to be this one". And I stand by that. Remaining with trilogies, Dreams of Gods and Monsters was all I could have wished for from the series finale – fantastical, twisted, boundless. It's also beyond bizarre that this time last year I had yet to discover A Song of Ice and Fire; entering the realms of Westeros was definitely a highlight of my year. Similarly, returning to the world of Scion was a treat – although I feel like a tease raving about The Mime Order, when it has yet to be released! Finally, another fantasy delight was Deathless – a deliciously disconcerting stand alone. CLASSIC LITERATURE: I read a fair few classics this year – although the vast majority were for school. This said, the classics I read in my own time were wonderful diversions. Northanger Abbey has quickly became my favourite Austen novel, whilst The Handmaid's Tale and A Room With a View were both incredible – and are now indelibly etched upon my mind. HISTORICAL FICTION: Burial Rites is one of those rare books which never seems to fade from memory – a stunning debut. And of course, this list wouldn't be complete without Life After Life – it's by Kate Atkinson after all. CONTEMPORARY FICTION: If you've yet to read The Goldfinch, you're in for a treat. It's a wonderful novel – up there on the same level as Donna Tartt's debut. Similarly, We Are All Completely Beside Ourselves is a huge accomplishment of the written word: simply fantastic. And, a hidden gem of the year, Mr Penumbra's 24-Hour Bookstore reminded me why I love reading. NON-FICTION: How to be a Heroine was easily one of the best reads of the year – funny, touching, warm, honest. It's a must-read for anyone who grew up surrounded by books. I also loved Eating Animals – but for completely different reasons. It informs, surprises, and ultimately challenges everything the reader thinks they know. I didn't have a lot of spare time throughout 2014, so blogging really suffered. That said, I did create some content I'm pleased with. Click here to see my favourite post of the year, and here to see the post which received the most views. Around September 2014, Feed Me Books Now turned 2. I can't help but feel a sense of pride, or rather satisfaction, about this – and, yet, at the same time, I'm a bit unsure. I love blogging – I mean, of course I do – but I don't know what I'm doing with this blog yet, or what I want to do it, or where it's heading. I think I'll just continue with what I'm doing, and see where this little blog leads me. TV SHOWS: I think it's safe to say 80% of my year was consumed by my constant watches and rewatches of Buffy the Vampire Slayer. To say I'm obsessed is a complete understatement. It's just a perfect show on so many levels, simple as. Sticking in the Whedonverse, this year I fell in love with the short-lived sci-fi classic Firefly: simply incredible. Another show I've been watching non-stop is Twin Peaks – I like my 90s cult shows, okay! GCSEs: I took four of my GCSEs earlier this year (these ones were early, I'm taking the majority of them next year). This basically caused huge stress, and diminished all blogging and reading time… but, thankfully, all the work was worth it in the end. WRITING: Due to the previous point, I didn't have time to write a lot during 2014… which is a slight downer, I guess. However Sylvia (my typewriter) wasn't entirely dormant, and I did write a few short stories throughout the year – nothing longer though. And so that was my 2014 more or less. How was your year? To repeat T.S. Eliot – “next year's words await another voice.” See you in 2015! 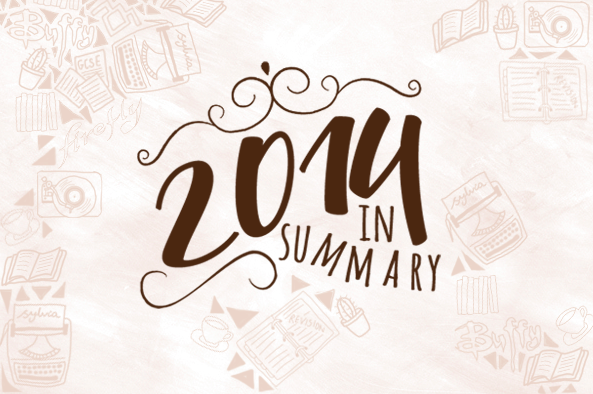 OOOH WELL BASICALLY YOUR BLOG POSTS WERE AWESOME THIS YEAR. And yes. Exam stress = severe damage to blogging/reading/writing/life. Aha it's certainly terrifying! I adored it though – such great dystopian. And aw, thank you! Hey! Another Brandon Sanderson fan! I've read a couple of his books, the Mistborn series included, and he's a really fun writer who always has really cool and original worlds. Have you read his book The Way Of Kings. It's the first in his new series, The Stormlight Archive, and is definitely the best book he's written, far superior to the Mistborn books. What point are you at in ASOIAF? I've almost finished the first half of A Dance With Dragons. Yay! Brandon Sanderson is wonderful – his ideas are never short of original. I've yet to read The Way of Kings, but I'm definitely intrigued now (given your praise). :) I've just finished A Dance With Dragons – loved it. Although the last two have been, in my opinion, a tad slower than the previous ASOIAF books. Ah, we have similar tastes in books than I thought, so now obviously I need to go track down all of these and add them to my shelves! I was pleasantly surprised by how much I enjoyed Life After Life, and Burial Rites has been on my wishlist for a while, so I might need to get stuck into that one! I read and LOVED Throne of Glass this year, which really opened me up to the idea that I might actually like Fantasy, after being intimidated by it for so many years, so Mistborn is next on my hitlist! I'm so pleased you enjoyed A Room With A View! It's one of my favourites. Half of these books you've mentioned have recently found a spot on my TBR, and I'm most excited to get to Burial Rites - it sounds like it should be right up my alley! Also, FIREFLY!! I didn't see the bit about Firefly the first time I read it! GO FIREFLY! A Room With a View is fantastic! And yep, Firefly is incredible! Hey Sunny! I hope your 2015 is also wonderful. :') And yes, Buffy all the way! Hope you have an equal amazing 2015 as your 2014 was! This was such a great and simple post to tie everything up with a nice little bowtie. Simply a wonderful idea, I might try to do for a middle of the year check-up. You always make me want to READ ALL THE BOOKS! Mistborn definitely needs to be read, also A Room with a View and The Goldfinch (which as you know I just bought, SO excited for it and for Americanah). Love this post. Your book photography is v. elegant and stylish.